I’ve been keeping some pretty strange hours lately. The television selection at 3 or 4 in the morning isn’t all that great, so I’ve been doing a lot of painting. I haven’t really shown off any of my Warhammer 40K troops lately but I can happily say that all of the soldiers that I have are finished, that leaves me a number of vehicles to work on. I have three boxes on my desk to get to; all of them have been patiently waiting since Christmas for me to work on them. I’m leaving the troop carrier and attack bike for later; I wanted to start on the big boy. 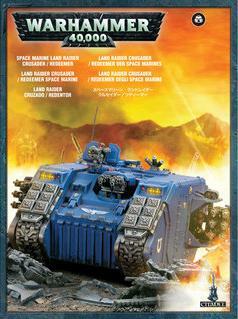 The Land Raider Redeemer is a durable tank capable of moving heavily armored troops across the battlefield and is armed with two extremely nasty flamethrowers. It is pretty much going to become the centerpiece of my army, so I really wanted it to look fantastic. 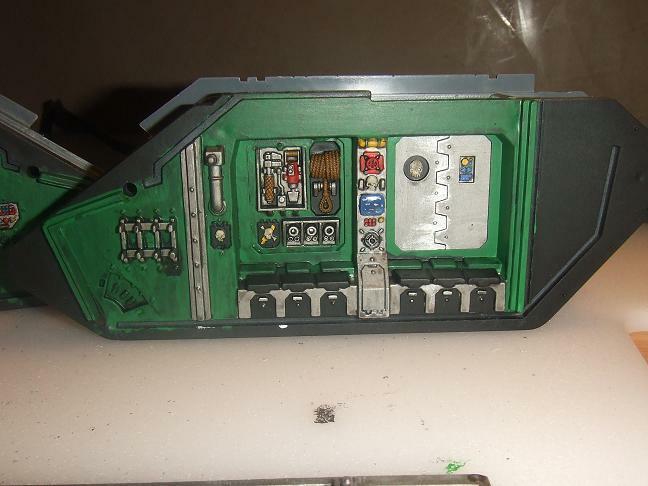 Because the Redeemer can carry troops, the model has opening doors. The interior of the tank is actually sculpted into the plastic. I could have gone the easy route and glue all the doors closed. That way I could save a ton of time and gotten to work on the outside of the tank. Except I had already said, this was going to be my army’s centerpiece. I had to do it right. 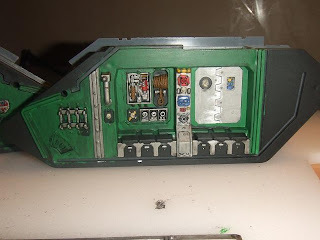 So I took out all the interior pieces of the Land Raider and started painting. The side panels have an insane amount of detail. 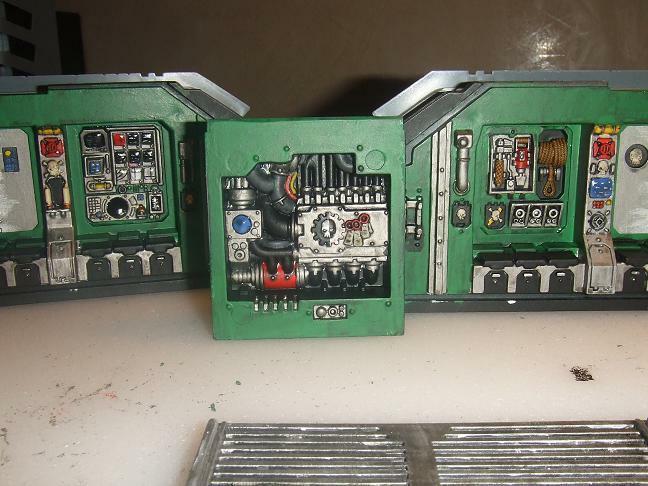 One of the things I didn’t like about the kit is that it came with two pieces to cover the side doors. 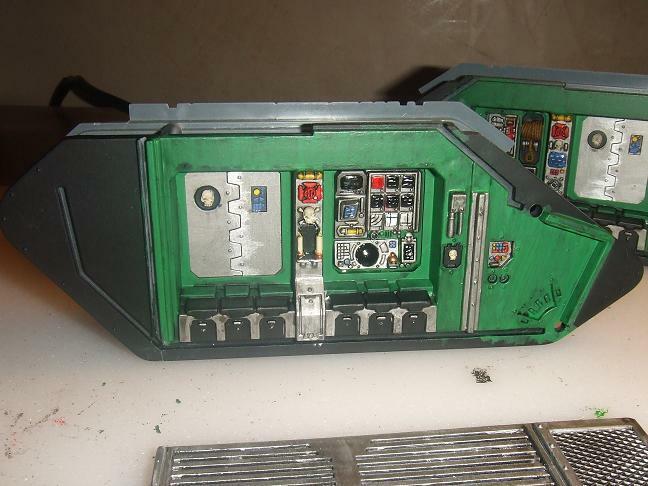 One of those pieces has a large instrument panel on one side and tools on the opposite side. The other piece is the set of doors. Since troops are supposed to be able to exit the Land Raider from the front ramp and both sides, I was very unhappy. I ended up ordering an extra set of both pieces. This way I could have the tool and instrument panel showing and a set of doors on each side. I paid around eight dollars to get the extra parts, but I think it was worth it. You may notice the computer monitors have a bit more glare on them than the rest of the model. After I finished painting everything I sealed the model with a matt varnish. Once that had dried I painted a gloss varnish on all the computer screens. At a distance it gives them all a nice glassy look that I’m really happy with. Since I’ve taken these pictures I’ve actually assembled most of the Land Raider. It will still take me a long time to paint the outside, but I feel like the difficult part is already behind me.